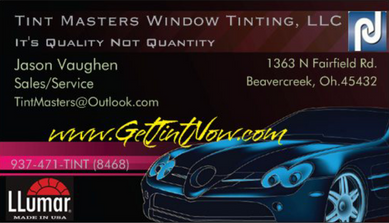 At Tint Masters Window Tinting we are focused on providing you and your car with the highest levels of customer satisfaction – we will do everything we can to meet your expectations. With a variety of offerings to choose from, we’re sure you’ll be happy with the quality & workmanship you will receive from us. Look around our website and if you have any comments or questions, please feel free to contact us. We hope to see you again! Check back later for new updates to our website. We know you have many choices when it comes to your automobile, and want the best quallity products & job you can get for the money. With that being said we offer Suntek Carbon Window Film which is made in the U.S.A. & carries a lifetime Warranty to never peel, bubble or change color for the life of the vehicle. We also offer extended business hours starting from 12-8pm so that you may get your windows tinted after normal business hours.